It took me about 4 hours to finish, but was actually pretty simple and didn’t take a lot of special tools. I made the table out of construction lumber (spruce). I debated about using pressure treated wood, or cedar, or some other “nice” wood, but decided against it because they’re all a lot more expensive, and let’s face it… this thing is probably going to get pretty dirty and beat up, judging by the look of the wooden side tables that we have had on our Egg for about a year. My strategy for assembling the table was to build the top counter, the bottom shelf, and the legs separately and then put them all together. Again, a good decision. Worked out very well. I used deck screws to fasten the pieces together. For the top counter, I built a frame using two A and four C pieces. I used five E pieces for the decking, leaving no space between them. After assembling the whole top shelf, I cut out a 21″ circle in the centre of the square section. For the bottom shelf, I built the frame using two B and six C pieces as follows. I used four F pieces for the decking, with equal spaces in between. The edges of the outside decking boards should align with the outside of the frame. Also make sure the outside C pieces are set 1.5 inches (or the thickness of a two by four) inside from the end of the B pieces. Finally, I put the two legs together as follows. 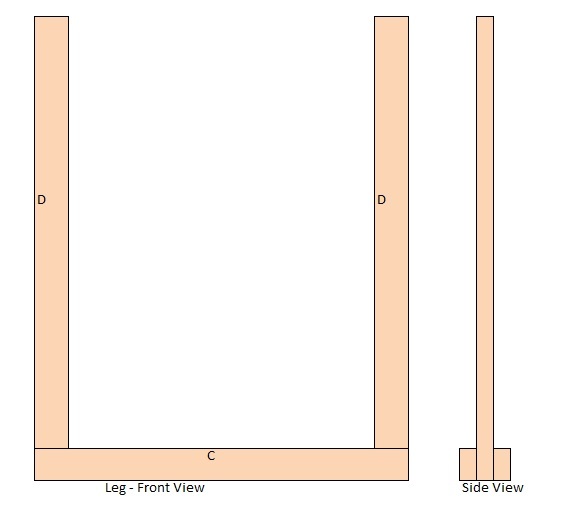 Each leg uses two D pieces and is supported by two C pieces outside of the D pieces at the bottom. Once I had the top shelf, bottom shelf, and legs built, I assembled the pieces together as follows. At this point, I had a working table! The only extra steps I took after that was to attach some caster wheels to the bottom of the legs at the outside corners. I bought 3 inch locking casters. If you use larger or smaller ones, adjust the height of the legs (D pieces) accordingly. Last step was to paint on a coat of water sealer to protect the wood. Good thing I did because we’ve had rain since and the water beaded up nicely on the table instead of penetrating the wood. Here’s how the table looked when finished. 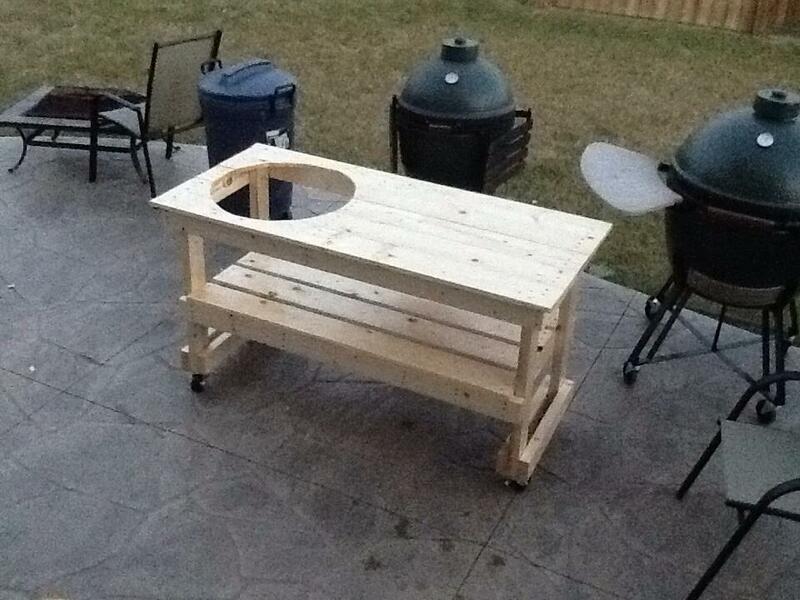 All we have to do now is buy a paver stone for the Big Green Egg to sit on and load the egg into the table. Very simple design, but it ended up looking pretty good, and is very stable. We had a huge wind storm the other day which blew the table across the yard and rolled it over a few times, and there’s no damage at all. Of course if we’d had the egg loaded into it at that time and engaged the caster locks, it would have been too heavy for the wind to blow over, but good to know it stands up to a beating! So now Brian has his table. Great Post, thanks for doing it. Really enjoy your site, as I am an Egghead myself in Ottawa, but I grew up in Winnipeg! That is awesome. Will you come build me one? Yes I will. Fly me down there and feed me some of your awesome looking food. 🙂 Or just take my word for it that it really is EASY and try building one. If I can do it anyone can! Good luck at Plano Eggfest! Hope you do win that small Egg! Hi! New member here, really like your build/table. I am constructing an outdoor kitchen and want to mount my egg large, like yours encased, but the cabinets are 24″ deep with a back splash right behind. i know i have to extend it out for it to fit and open fully with spring in back, any idea how deep your countertop and cabinet is and how deep it would have to be if it had a wall directly behind it? Cabinets are fixed, made of steel, and mounted agaisnt a retainingg wall, hence the back splash. The frame of the table is 25 inches deep from the outside edges of the frame, or 22 inches between inside edges. With the decking on top which extends a bit beyond the outside of the frame, it makes the table 27.5 inches deep. You need at least 21 inches of depth to accommodate the egg, plus extra for the back hinge. What size decking screws did you use? I used 2.5 inch screws. I built my table this weekend. Thanks. Only thing I noticed is that B should be 52 inches not 55. Other than that everything was spot on. Thanks for the info. Nope, B is 55 inches. The distance between the inside edges of the table legs is 52 inches, but the B pieces stick out an extra 1.5 inches from the C end pieces in order to overlap with the legs as shown in the picture I took. The only way it would be 52 inches is if you cut your B pieces to line up flush with the C end pieces instead of overlapping across the legs. In the middle of following your plan here.. my issue is that the 1×6 F pieces need to be shorter… If B is indeed 55″ then F needs to be shorter.. 52″ not 55″ in your table above. You are correct, Rob. I entered the dimension for F incorrectly. Thanks for pointing that out. I cut those down to 52 and its all good… also didn’t leave the small gap on the bottom shelf planks, just pushed them together flush and cut another 1×6 to go all the way to the edge of B.
I’m picking up my new Large BGE tomorrow.. is that the size of yours? Are you happy with the size of the hole and height of the egg coming up through the top table? I am holding off on cutting mine and assembling the shelf until I actually have my egg to do some final measurements. THANKS! Yes, ours is a large, and that is the size this table is designed for. We are happy with the size of the hole, and the height of the egg in the table. If you put your shelf on lower then you run the risk of the hinge for the Egg’s lid interfering with setting it into the hole, and you may need to cut a bigger hole too. I like your table. I bought my first Large BGE today, and started on the table tonight. I got $130(us) in lumber and hardware. I saw a similar table at bbg store they wanted $500. I want to finish the table first before I fire up the BGE. Did you use the table legs, or did you use pavers under the egg. Thanks for the cut list! We placed a paver stone on the bottom shelf, and then placed the egg on the little egg feet (spacers) that came with our big green egg on top of the paver. This keeps a small space between the bottom of the egg and the paver and will keep the paver from getting too hot and burning the table. Will this work for an XL if I just cut a bigger hole for the Egg? I think several of the table dimensions would have to be increased to fit an xl, not just the hole size. The table depth isn’t much bigger than the xl diameter to begin with.